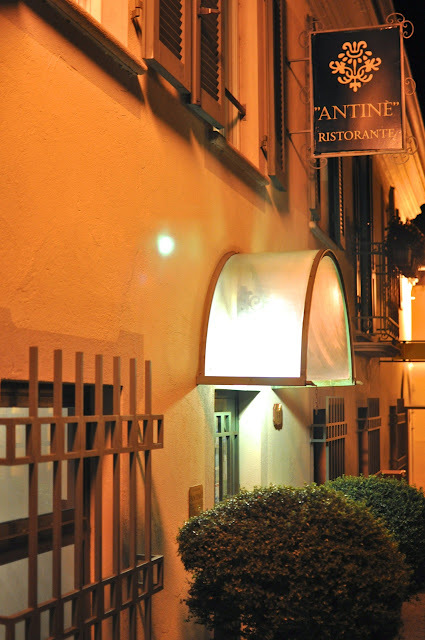 Update: In the 2013 Michelin Guide, Antine lost its Michelin Star. 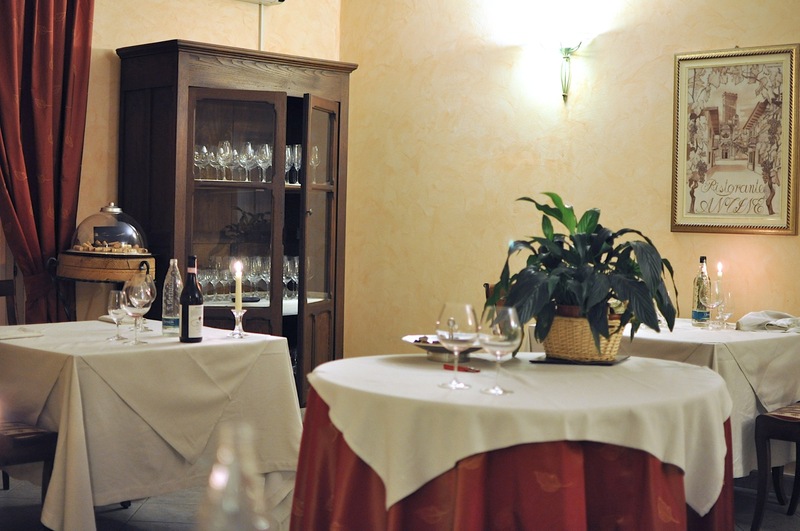 Antine is a 1-Michelin star traditional Italian restaurant set in a stone house in the small hamlet of Barbaresco. It is located right next to the very discreet and large black forbidding doors of the Gaja winery, the foremost (reputationally at least) wine producer in Piedmont. The restaurant seating area is actually on the second floor and you'd have to ring the doorbell for someone to come downstairs to open the door for you. 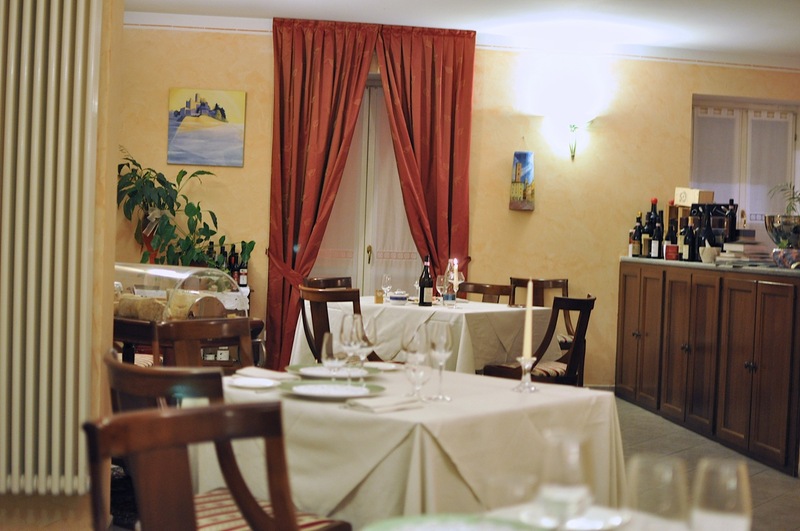 This restaurant is very private and at times (as we tried when we were in Piedmont last year) they don't even pick up the phone to take your reservations. Needless to say, reservations are essential here (if they don't have reservations for any night, they'd not even be open, so walking in without reservations is not advised). In fact, when we rang the doorbell last night at 8pm, the waitress opened the door and peered out curiously at us, until she found our reservation made by our hotel. It was as if she wouldn't let us in if we did not have a reservation, which is not normal restaurant behaviour seeing as they were less than half full that night (the restaurant probably sits about 20 pax a night max). There were only 2 staff members running the floor that night, which resulted in us (and the other diners) waiting a bit to get their attention, but this was not a bother given the very relaxed atmosphere of the place. The interior decor was very plain; it looked like a breakfast dining room of a B&B or 2 star hotel in Europe. The menu was also quite simple; they had a five course degustation menu at a very reasonable price (relative to any other Michelin star restaurant). The wine list here though, was exceptional. 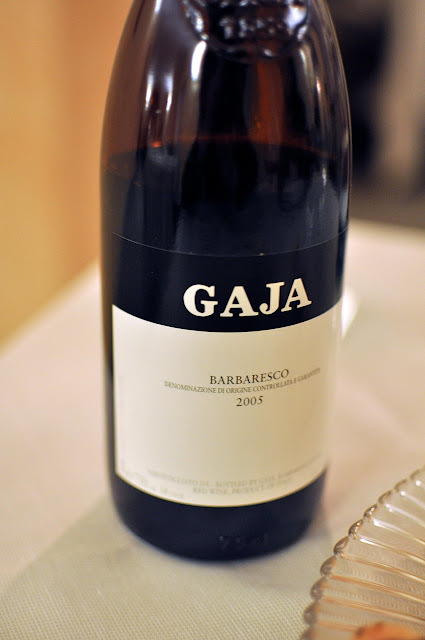 I would not have imagined being able to find a Gaja barbaresco at the price which I saw in the wine list here. Without question, I had to order it. Initially, I picked the 2004 but after rummaging through their cellar, the waitress regretfully informed me that they had sold out. Instead, I went for the 2005, which was slightly cheaper and not much worse off than my initial choice. It was an inspired decision, as the wine drank as well as its heady reputation suggested. Amuse bouche was a rather substantial tuna tartare which was very tasty, followed by the first courses. We opted for the ala carte menu as we wanted to have just one white truffles dish (instead of none for a normal degustation menu and all for a truffle menu). 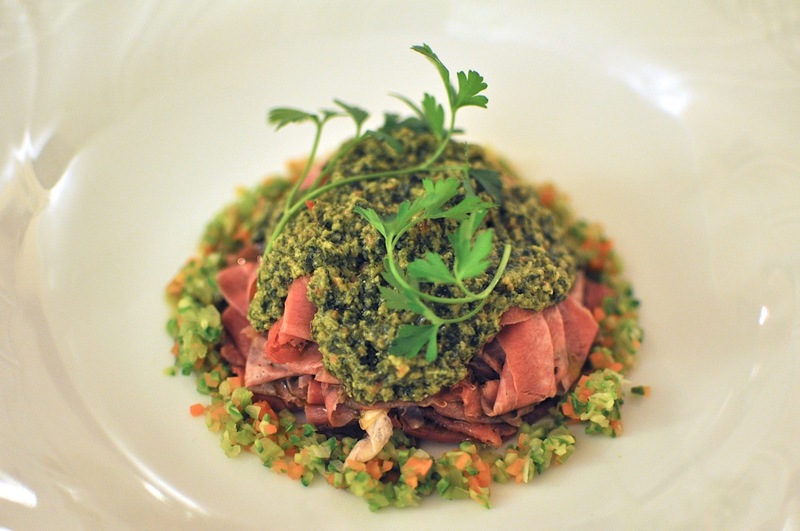 For the Antipasti, I had the slices of veal tongue with traditional salsa verde of garden herbs, which was very good. 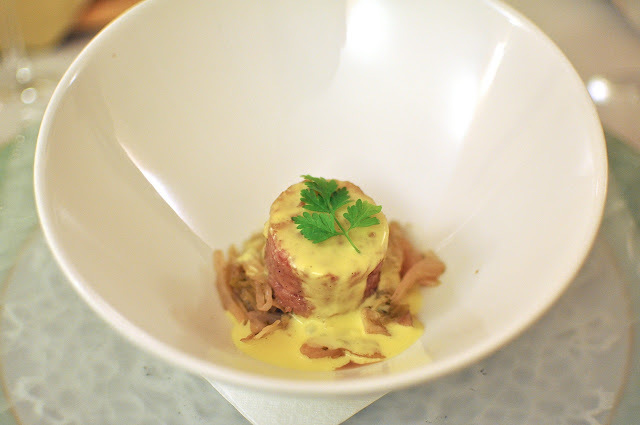 The veal was tender and light, while the herb salsa verde was sour and full-flavoured. 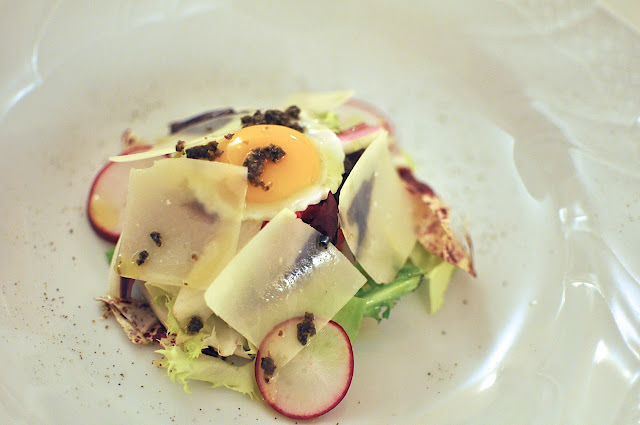 My wife had the Piedmontese veal capaccio with quail eggs which was also pretty good. For the Prima Piatti, I ordered the Agnolotti "del Plin" stuffed with roast veal and cooked with sage and butter. That's the thing about Piedmont. The Plin is one of their signature dishes and everywhere you go, there it is on the menu. And it looks so appealing with its bright yellow eggy pasta, glistening in a layer of butter or olive oil. 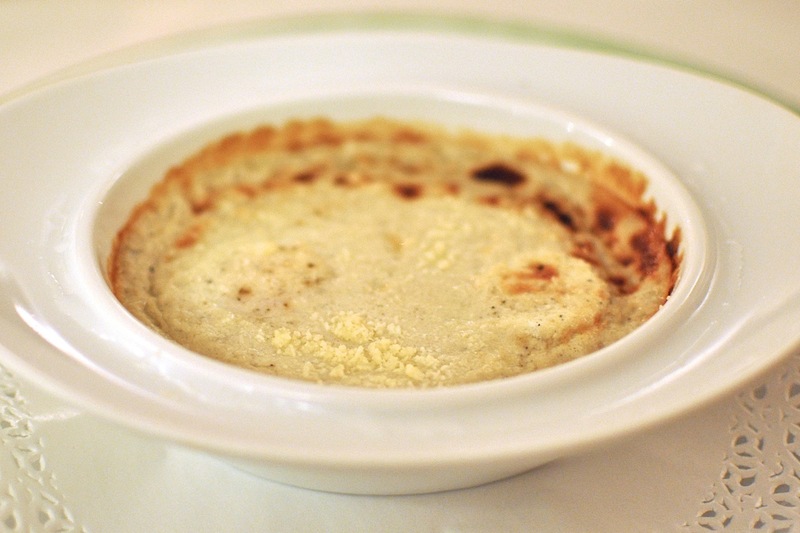 When you eat it, the pasta has a rich taste and a firm texture and the veal is a good complement for a meat stuffing. It is such a simple dish: a homemade pasta stuffed with meat cooked with no sauce. However, it tends to fill you up really quickly, and in our experience, would expand in your stomach a few hours after eating it. 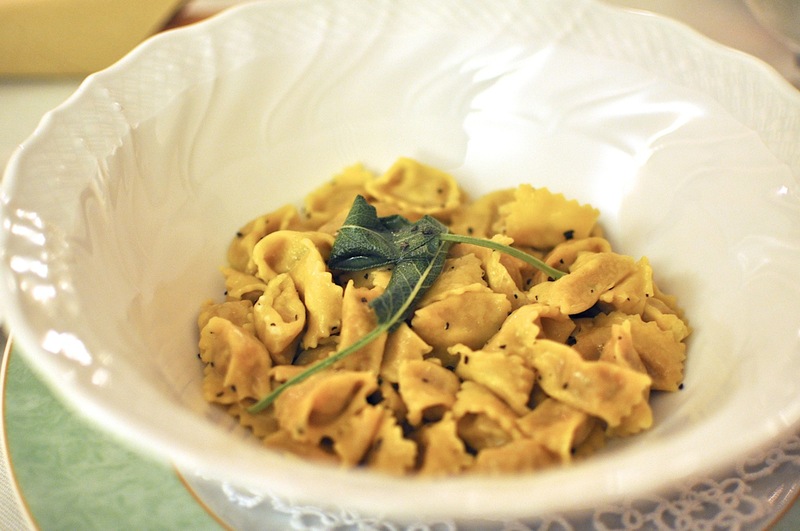 Despite having it on every day of our trip in Piedmont, we never got sick of this dish. Tonight's Plin was just as good. The sage added a layer of complexity to the Plin which differentiated it from the Plin which we have had elsewhere. However, it is after this meal that we coined the phrase "death by Plin", as the portion of Plin served to me at this restaurant was the largest I had ever come across (the picture below is of a deep bowl of Plin, what is visible is only the first layer of Plin and there was at least 3 layers of it). It was easily double of what I was used to eating at other restaurants. And having managed to finish it, I would suffer the consequences a few hours later at night. That night, in my sleep, I was plagued by a nightmare reminiscent of the old 'Aliens' movie where I was pregnant with a large giant alien Plin baby and it was growing by the second, trying to break me into two to get out. My wife ordered the tajarin with sausage ragu with herbs and spinach, which was also very good. The pasta was cut very thin (making it taste like eggy chinese noodles), but despite its large portion, the dish tasted very light (unlike the Plin). 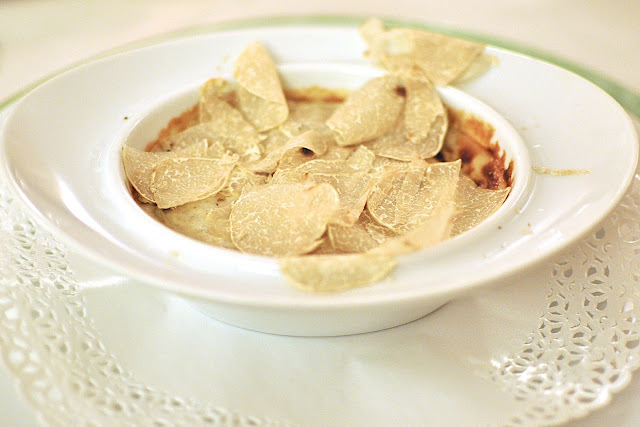 The main course dish we both had was the farm eggs baked in cocotte with black and white truffles. The black truffles were already cooked with the egg, and the white truffles were then shaved very generously at our table. The truffles here were lovely, and the truffle flakes were very white and large, giving out a fantastic aroma. 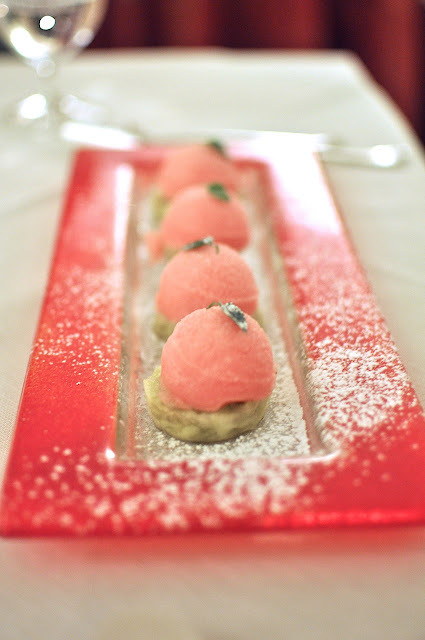 For dessert, my wife had the sorbet on biscuit, which was refreshing (although we didn't think the combination went quite well, and if you wait a bit and the sorbet starts melting, all you get is a soggy biscuit). 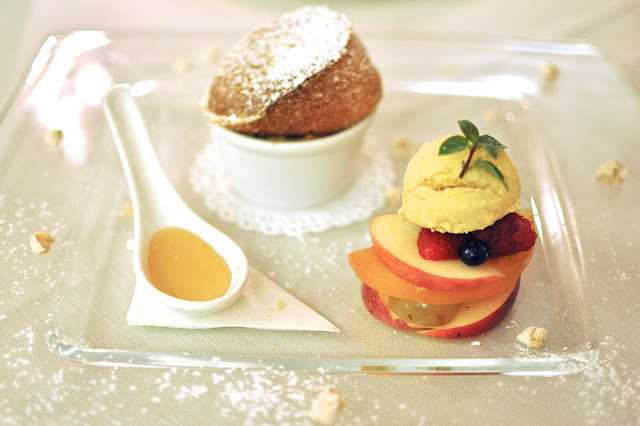 I ordered the souffle which was quite ordinary. 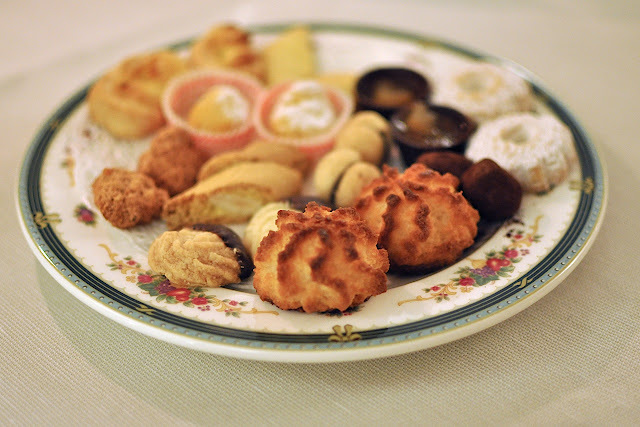 Petit four was also quite unremarkable. Final Thoughts: It was a good but not exceptional meal in a homely and comfortable restaurant. The dishes were traditionally prepared and served in hearty portions, and were very reasonably priced. What made the meal totally memorable was the bottle of Gaja Barbaresco, which was stunning and in itself worth the visit (and at a reasonably price). 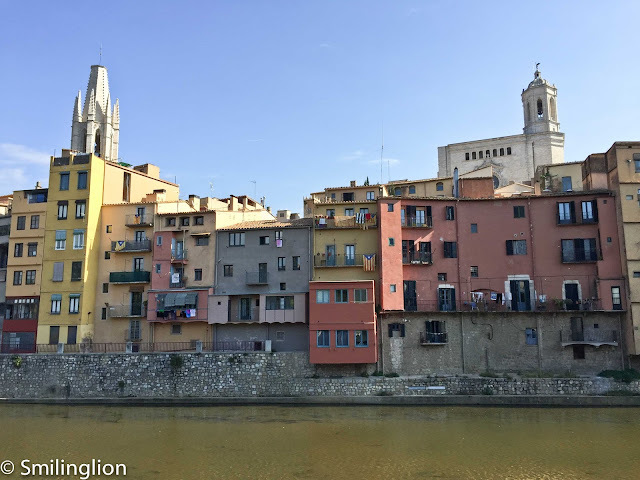 In fact, if I'd want to have a really good bottle of Barbaresco with really good food at the best possible price, I'd struggle to think of somewhere better. Service was friendly albeit a bit slow but it had the feel of a country inn so we'd expected the pace of the food to be rather relaxed. What a dream to have! Never thought you could be plagued by thoughts of overeating! 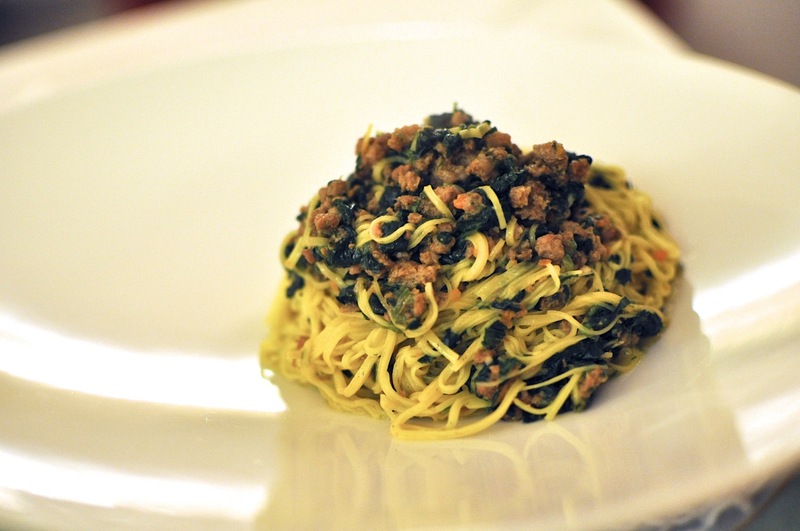 But the tajarin with sausage ragu looks so yummy, I'm tempted to cook up a pasta dish right now, at 2.30 in the morning..